Hoo, boy. Carrie Fisher sings a song about Wookiee Life Day to the tune of the "Star Wars" theme song. 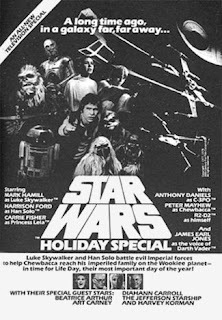 "The Star Wars Holiday Special" only aired once, in November 1978, but thank Boba Fett somebody somewhere taped it, because it is unforgettably bad. We have an item on it in "Whatever Happened to Pudding Pops," of course. Have you ever seen it? Do you remember the fuss about it at the time? I don't, didn't hear about it until years later. Kinda like the round Wookiee treehouse though. Oh, man. I lasted until the first few lines of the song, then I had to bail. I just can't watch. I didn't hear about it until a year or so ago. I watched it. I was 7, & loved it, though I don't remember Bea Arthur. For years I thought I imagined it because no one mentioned it. Thank God for the Internet! I watched the entire thing recently & wow! It's bad!!! & not in a cool campy so bad it's good way. It's just bad.